I had every intention of posting this one yesterday but Valentine’s Day and a nasty cold got in the way of me writing this up. Nevertheless, we’re back in the Western Conference for a bit on our team-by-team season previews today. Hopefully I’ll get back on the double dip in team previews and have a second today. We’re headed to Texas to look at Schellas Hyndman and FC Dallas. This has been an interesting offseason in Frisco. As most of you know I cover the team here locally for BigDSoccer.com and do some writing on the side for FCDallas.com as well. I’ll do my best to leave any team bias at the door here (I try to do my best at that on this space when writing about them). 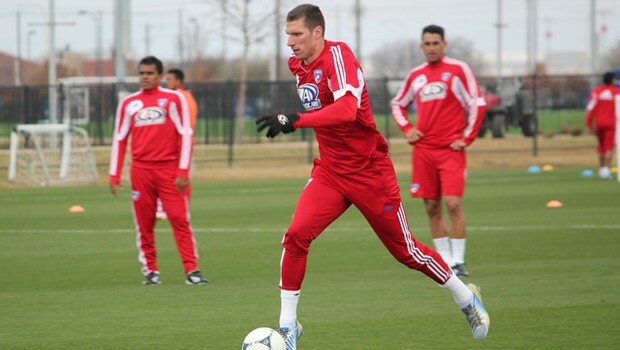 Dallas just missed out on the playoffs last season and after an offseason of big changes, the club hopes to rebound big in 2013. [quote style=”boxed” float=”right”]“Before, if Blas didn’t score, we were questionable about who was the next guy coming in. But right now we have proven goalscorers in three different guys and that’s not looking at Fabián [Castillo], Jackson and David [Ferreira]. I’ll tell you right now, I’m excited and looking at the team offensively, I’m excited,” said FCD Technical Director Fernando Clavijo. [/quote] 1. Will a switch to a 4-4-2 be enough? One thing that Dallas struggled big time in 2012 was creating chances offensively. Hyndman mostly used a 4-1-4-1 (or in some folks eyes it was more like a 4-4-1-1) that was to utilize David Ferreira’s skill set. The thing was Dallas never got to use their strongest lineup until it was too late last year. Injuries killed their season early on and by the time everyone was healthy it was almost too late. So why a move to a new formation? Simple, the roster has changed, and Hyndman finally has a group of strong strikers to go to make this switch. Ferreira will have Blas Perez, Kenny Cooper and Eric Hassli to set up in the attack. Having two quality strikers in front of him will also help take some of the pressure off of him as well. The bigger issue will be if Andrew Jacobson can handle being the workhorse in the midfield behind Ferreira. That will be the true test if this switch will be successful as the defense is still solid. 2. Will anyone really notice Brek Shea being gone? In all seriousness, I don’t think most will. I liked Brek and enjoyed covering him these last few years in Dallas. But at the end of it all, it was time for him to move on this winter and I think most can understand that it was probably the best time for it to happen. It opened up many doors for Dallas to make big moves like landing Hassli and Cooper and it will help make the team deeper in the end. They still have work to do on gaining depth on the wings behind Fabian Castillo and Jackson, but with the extra allocation and salary cap space left on the table, it won’t take long for fans to find a new favorite (hello George John, Zach Loyd or even Cooper). 3. Can this team remain healthy? Depth is there in most cases (except the wings and behind Ferreira) but the bigger issue is can this group remain healthy for the season? In a way the last two years Hyndman has had to deal with more injuries than most coaches in this league. Last year it got so bad that at one point he had nine of his 11 starters out of the lineup thanks to injuries (and suspensions). As long as Ferreira stays healthy this team will be fine. As he goes, so does the team. Fabian Castillo – It is year three for the young DP, he knows it is his time to shine and so does the club. With a better and stronger attack in front of him, I expect huge things out of this young speedster. – Dallas will loan out one of their HGPs. They already have one out on loan in Moises Hernandez but I think at some point we’ll see another HGP loaned out as well. My bet is Richard Sanchez, the young keeper that Dallas signed up a couple years ago. Look for him to head south of the border at some point on a loan. – The Cooper/Hassli/Perez trio will score big. The offense should do very well in Dallas this year. Their schedule is set up nicely for them to make a big impact early on too. I don’t think they’ll score as much as San Jose did last year but I do think at least two of them will be around or above 10 goals this year with the third being a couple off that pace. Dallas needs at least two of them to be at 10-14 goals this year to be successful. – Dallas will make one big trade this summer that helps their roster. This club has not been shy to trades over the last couple of years and while some have been great (Julian de Guzman), others have not been (Jeremy Hall). I think though they’ll strike a smart deal at some point this season to being in a piece that helps fill out their roster. Not a game-changer but a solid depth piece.